Samsung has just announced an interesting new feature coming to its 2019 range of Smart TVs. Samsung explains that you can connect its new 2019 Smart TVs to your PC, laptop, or mobile device anywhere in the world thanks to VMware Horizon, a Virtual Desktop Infrastructure (VDI) solution. 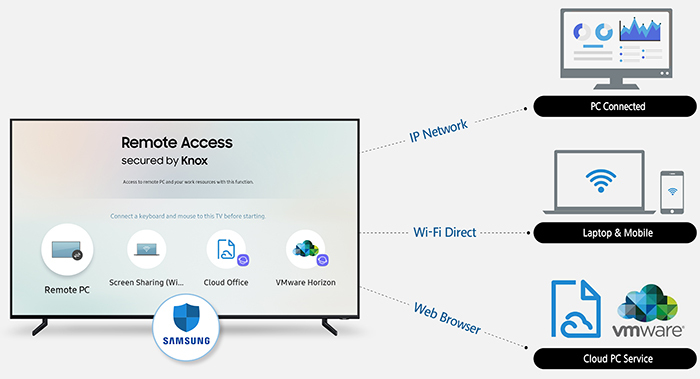 With any such connectivity, security is very important and Samsung has integrated its proprietary Knox security technology into its Remote Access features to help make it as secure as possible. Users can access files and work on documents stored by cloud services directly on their Smart TVs. We expect to hear and see more about Remote Access, hopefully with some demos, at the CES 2019 next month. The technology behind ‘Remote Access’ is from well known virtualisation software firm VMWare, a subsidiary of Dell. Samsung and VMWare pledge to continue to work together to develop intuitive and productive user experiences for remote working scenarios. If you are interested in using this feature with your PC then you might be happy to learn you will be able to connect a keyboard and mouse to the Samsung Smart TV for full control. VMWare has a dedicated page for its latest Horizon 7 product, which is likely to be closely related to Samsung’s Remote Access. Remote Access can deliver a web browser-based cloud office service. Related tags : access cloud service feature pc samsung samsung electronics tv tv screen vmware vmware horizon. Have Asante Kotoko prepared adequately for the Caf Confederation Cup?